Do you have just one constant answer to this question? Or does your answer vary depending on what is blooming in your garden or ready for harvest when someone asks you "why do you garden"? I can come up with a thousand answers when I'm asked why I garden, but today I have just one answer. It is blooming today in my garden. Bees are buzzing around it. The flowers are a perfect white. I am star struck by it. My neighbors must think me odd (again) because I have taken pictures of it every day since Sunday, hoping to get a picture of it at just the right moment. And I think today is that moment. 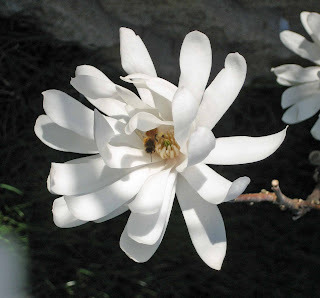 Today, I garden because of the Star Magnolia. You're so right! There is always a new reason to love gardening...a plant, a flower, the first sun-warmed caprese of the year, a feeling of contentment, excitement at some success...and your magnolia is lovely! It certainly deserves the honor of 'reason to garden'...at least for the moment! carol - im looking for this tree right now! the only one I can seem to find is the Jane Magnolia. i wanted a Star for the corner of my front garden. thanks for posting this. Oh, my goodness. Is there anything more beautiful? Your photos have sold me. I need to know - do they have the same heavenly fragrance as a common magnolia tree here in the south? Oh, sob! I miss my beautiful Stellata. Sigh. Thank you for the photos. Your plant is gorgeous. I so want one of these! Beautiful! Your Magnolia is certainly a Star CArol. 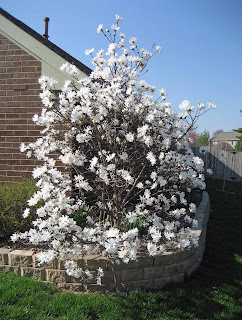 I have been fixating on our Saucer Magnolia lately too. This has been such a good year for Magnolias. Why do I garden?? Because I have to. That is so beautiful! If I had a star magnolia I would be out there every day for five days taking pictures too:). Thanks for sharing! Very lovely. 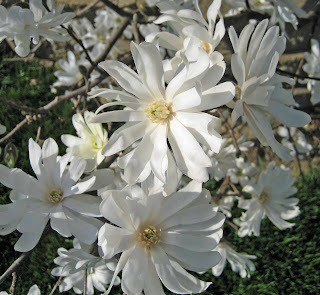 The star magnolia looks like the diva of the garden. I do exactly the same thing when one of my special favorites flowers--takes photos every day. What's funny is that now with digital cameras making that so easy, I can see I've taken the same photos year after year. Nice one. I am wishing for smell-o-vision a lot lately. :) Is it very fragrant as well? Ooooh! Mine is still in tight bud but thanks for the preview. Today, for me, it was the chionodoxa with the raindrops on them! Isn't that your new garden bed? Carol, how far from your house/fence did you plant this? I'm agonizing over where to plant the magnolia I plan to buy in the next couple of weeks. And still deciding between yellow butterfly mag and a star mag. Wow! That is gorgeous! I don't think I've ever seen one of those in bloom. I'd be star struck, too! Beautiful! The Star Magnolia is bursting with energy and life. It is really lovely. Yours looks perfect this year! Around here last year nearly all of them had their display ruined, except for mine. (I hope I haven't jinxed it.) It's just starting to break open the bud casing. Don't you love its (sometimes illusive) fragrance? I know exactly what you mean! Today I garden because of my roses. Thank you all for the comments. On the scent, I don't want to disappoint anyone, but I've not noticed much of a scent from the flowers. I'll have to go out and smell again. In the meantime, just imagine it smells fresh, like early spring. Stunning Carol. I love to take pictures of whatever is in flower. I am waiting to go and buy some gas for the mower and me and my son will be out mowing this weekend. Carol, I have wanted one of these for quite some time. I saw a 'Jane' today that I almost bought because the price was right, but even so, I'm holding out for the Star. Maybe I'll be able to find one this year as we travel around and visit various nurseries. Yours is beautiful and demonstrates clearly why I want one. OOooo I garden because of that magnolia as well. 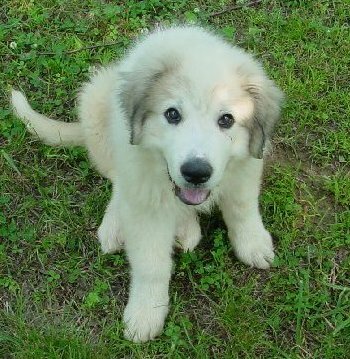 Now I must get me one. I always have the same answer - to be outside and to create and really it's the truth. Wow I've never grown flowers... this wonderful plant had make me change my mind! Nicely put indeed, Carol. I was looking at my Stellata the other day, admiring its nice fat buds, then I went around to look at 'Anne' one of the purple-pink flowered varieties. I only planted mine last year but it settled in very well--it may not flower this year but I'm tempted now to go get 'Yellow Bird' too...such wonderful plants, these! WOW. And that beauty is definitely reason enough to garden today.